I am delighted and grateful, that Holly Marie Colino has written a Guest Post for this site, about The Star Tarot Card. The Star Tarot Card symbolizes that you are liberated from false securities. After the death of a situation or a towering event you learn that what your intuition said was no good, must be discerned and complimented with critical thinking. You also may have noticed that allowing yourself to yield to external pressures or stigmas has gotten you into situations where your true self could not be honored and unleashed. This causes acceptance of what you have created and gives new insights into your development. New hope and personal power supports you to move authentically. Passionate energy resonates within you from the valor you displayed in getting through the trials. You now have hope for manifesting your desires. This is a time to reinvent yourself and your life. You are the energy that radiates and magnetizes what you can attain. Why not rejuvenate your entire core being? 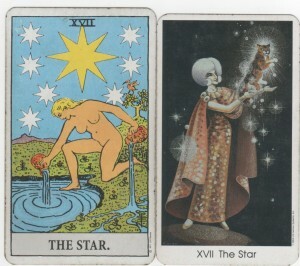 The Star Tarot Card is symbolic of physical, emotional, mental and spiritual cleansing. The energy of the Star Tarot Card tells you that you now have enough time to evaluate yourself and accept your truth in order to manifest harmony. Do my beliefs support my desires? What choices can nurture my desires? Are my behaviors facilitating my desires or blocking them? Can I accept myself so I may accept the right decisions in order to prevent oppressing and meaningless situations? Remember; you do not want to create an oppressing future or another decision that will be another false security. The Star Tarot Card is really telling you that you must utilize the past and contemplate what situations were false securities and oppressing and why. What were you trying to be and who you honestly are. A real process of ascension is liberating because you are releasing the falsehood within your true self and loving yourself enough to accept your truth and live by your truth. Living in your truth will influence choices that nurture and empower yourself in order to create a life that brings you happiness and lasting security. The Star Tarot Card was written by Holly Marie Colino.